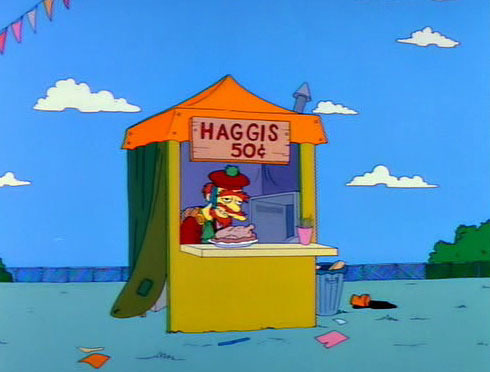 A little background, in case you never watched the Simpsons: haggis is one of those legendary nightmare foods that on paper just sounds… so… visceral. Basically, you take a sheep. You pull out all the parts that allow the sheep to live: heart, lungs, & liver. You grind ’em up, throw in some onions and oatmeal for good measure, then shove it all back into the sheep’s stomach and boil it. What you end up with is a coarse meat “pudding” that looks like something that plopped out of a David Cronenberg movie. But hey, 5 million Scots can’t be wrong, can they? Unsurprisingly, the classic pair for haggis is Scotch. However, the Wikipedia article said that a “lighter body, tannic red wine” would also be appropriate. So emboldened, I kept asking around for pairing advice and the consensus was to serve a wine with a “bloody” characteristic, something sort of gamy like a Crozes-Hermitage. 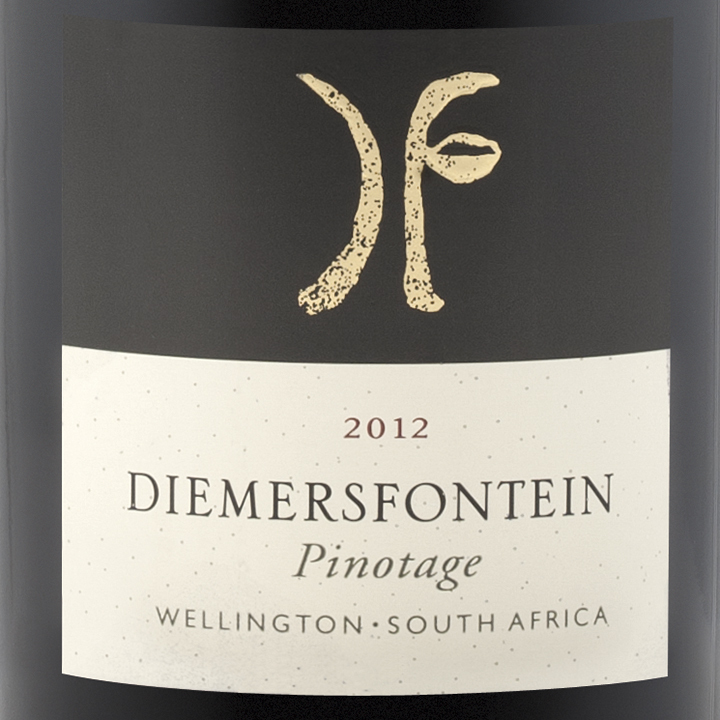 Someone suggested Pinotage, and for whatever reason that clicked, probably because I had been sitting on a bottle of Pinotage a friend had brought back from South Africa and I’d been looking for an excuse to open it. This was my chance! I showed up with two bottles: a 2012 Diemersontein Pinotage, and a bottle of Glenlivet 15yr in case the wine turned out to be a terrible idea. There was a moment of anticipation. Glasses of Scotch were handed out. A poem was read. The haggis was revealed. Like all good horror shows, the monster should never be in perfect focus. Now, it’s important to note: this was not an intensely authentic haggis. It turns out that sheep stomachs and lungs are illegal to sell in the United States. Something about all the effort it takes to get the mucus out of the lungs (squeamish Americans!). 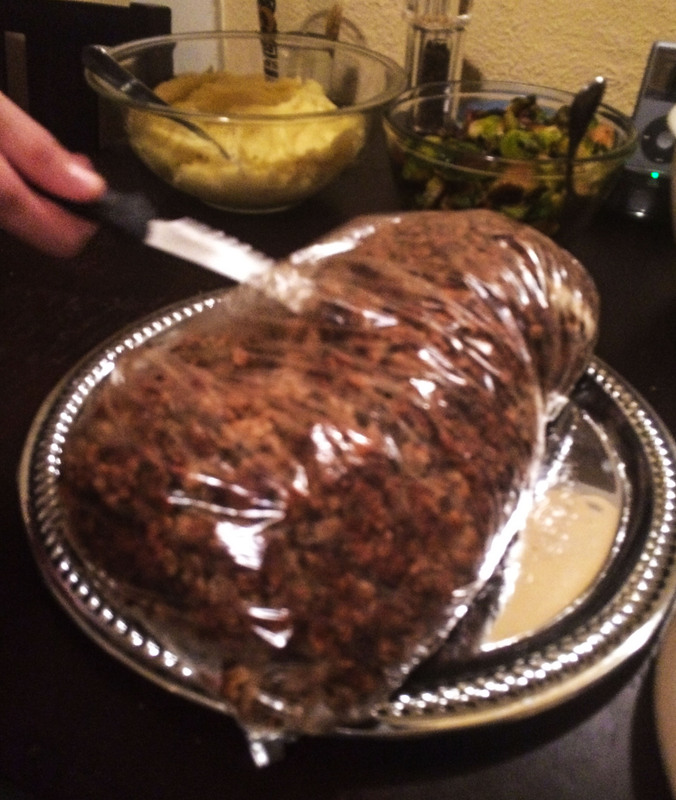 So this haggis was primarily ground lamb with oats and chopped liver, stuffed into a much less horrifying plastic oven bag, thus robbing us of the full haggis experience of watching the host jab a knife into the swollen stomach and seeing the steaming, particulate organ matter bursting from the wound. 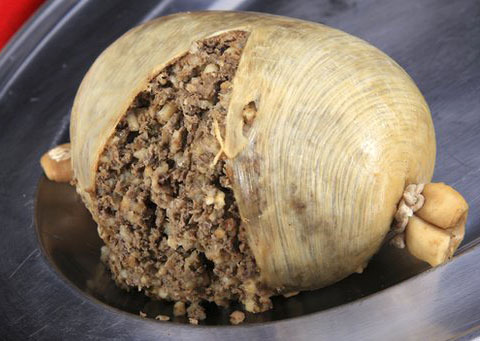 But my friend did a fantastic job with the organ tissues available to her at the time, and I offer her fervent kudos simply for daring to make haggis in the first place. As for the haggis, it turned out to be a very solid “hey, that’s not so bad!” Most people agreed that it smelled a lot worse than it tasted, and that it did in fact taste pretty dang good, with a rich, nutty flavor. It was reminiscent of a more unctuous Mexican chorizo without the spice (I kinda wanted to make tacos out of it, to be honest). 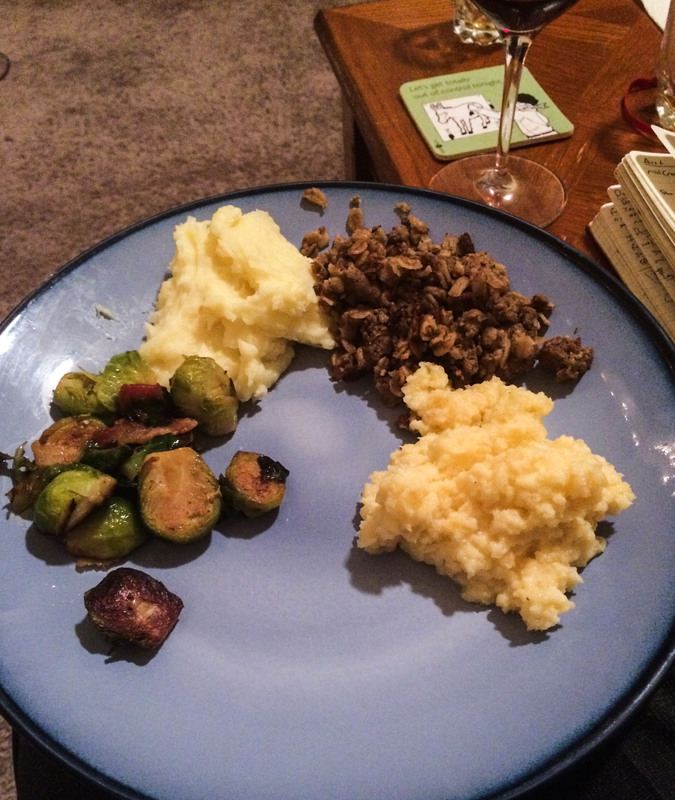 And when I tried it with the wine… they worked pretty well together! I would have preferred something with a bit more acid to cut through all that rich, fatty meat, but all in all the tangy berries in the wine matched pretty well with the savory haggis. Wikipedia was right about the light body thing: haggis is surprisingly delicate in terms of wine pairing, and if the Pinotage had been any bolder, it might have been too dominant. While they didn’t necessarily elevate one another to a level of enjoyment not attainable on their own, the Pinotage and haggis certainly complimented each other sufficiently enough that neither one felt diminished or out of balance. The exercise definitively confirmed that Scotch isn’t the only game in town on that rare occasion where you find yourself face to face with a serving of boiled sheep organs. It was certainly a nice lesson in not judging a food by it’s preparation methods, too. The haggis was full on tasty (though I’m completely okay with only having it once every year or three. I am a squeamish American, after all). I know next to nothing about wine but thanks for the laughs about haggis!